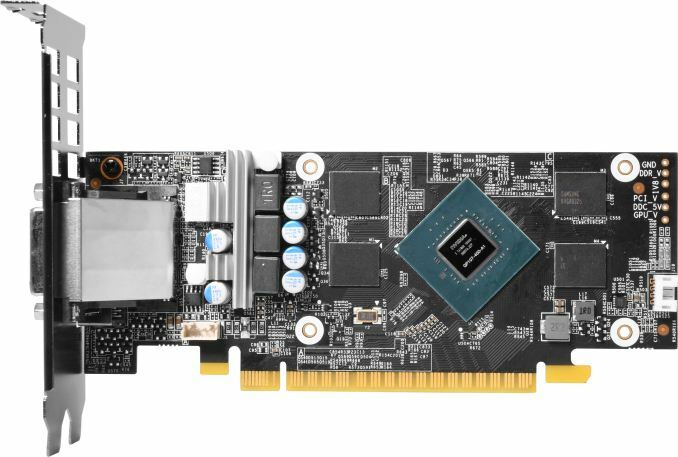 GALAX has joined the list of manufacturers to offer low-profile video cards based on NVIDIA’s GeForce GTX 1050-series GPUs. The boards resemble similar products from other makers and are designed to upgrade low z-height PCs or build affordable small form-factor HTPCs. As with the other 1050-series parts, these are <75W, meaning no PCIe connector is needed. The GALAX GeForce GTX 1050 OC LP and the GALAX GeForce GTX 1050 Ti OC LP graphics cards are powered by NVIDIA’s GP107 GPU in different configurations and are equipped with 2 GB and 4 GB of 7Gbps GDDR5 memory respectively. Both add-in-boards use the same PCB design, which the manufacturer is proud of because it uses solid-state coils and has an additional heatsink on the VRM MOSFETs. For the main GPU cooling, the cards also use the same dual-slot dual-fan cooling system featuring an aluminum heatsink with a copper base. As for connectivity, both AIBs have the same set of outputs: one DL-DVI-D, one HDMI 2.0b and one DisplayPort 1.4 with HDCP 2.2 support. 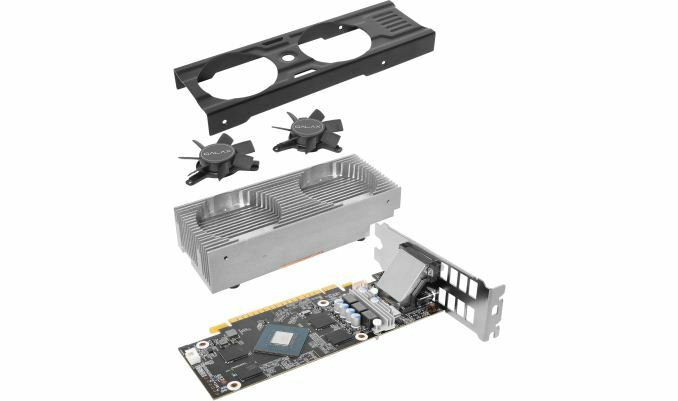 The new low-profile graphics cards from GALAX run ~12 MHz faster than reference designs. The 1% frequency increase does not have any effect on the official power consumption of the cards, so their TDP remains at around 75 W level. They do not need any additional power connectors and can be installed in any modern PC with an open-ended PCIe slot. GALAX is the third supplier after GIGABYTE and MSI to officially launch low-profile GeForce GTX 1050-series video cards. While demanding gamers hardly pay attention to low-profile cards, these come handy when upgrading low-cost PCs or building miniature HTPCs. The GP107 chip supports DirectX 12, Vulkan, and has an advanced media playback engine that features hardware-accelerated decoding and encoding of H.265 (HEVC) video. 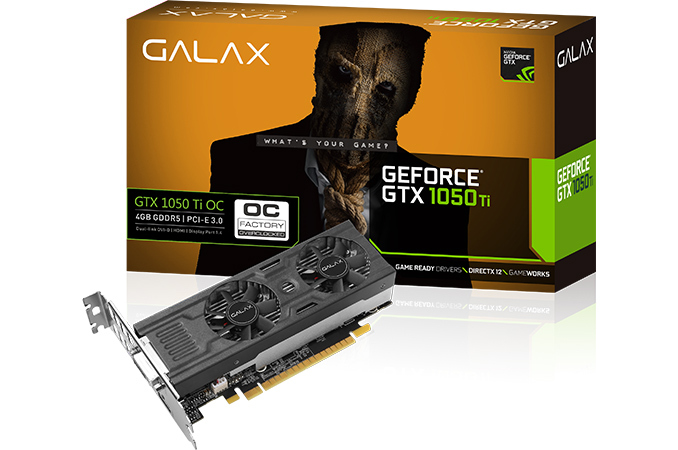 As reported previously, considering the positioning of the GeForce GTX 1050-series products, it unlikely that the new cards from GALAX will cost significantly more than NVIDIA’s MSRPs for similar video cards: $139 for the GTX 1050 Ti and $109 for the GTX 1050. Meanwhile, it remains to be seen when are we going to see the low-profile GALAX cards in the US. Right now the company’s online store as well as Amazon.com do not have them for sale. Since the GALAX brand belongs to Palit Microsystems, low-profile GeForce GTX 1050-series graphics cards from this manufacturer may emerge under different trademarks in different parts of the world (e.g., Gainward or KFA2 in Europe). I've got a GT 730 in my work computer, powering 3x 1080p screens. The CPU is only a dual-core Pentium something or other, so the GT is a heck of a lot more powerful than the onboard Intel graphics that only support dual-screen setups. Was hoping to upgrade to something newer, but there aren't any silent, low-profile GPUs available. Really hoping someone figures out how to make one using a 1000-series GPU. I really don't want to use a tower case. The slim desktop case I have now is mostly empty space as it is. I have a Core 2 Quad Q9650 rig which is screaming for an upgrade from the old Radeon 6570 that's in it. But it can only have a single slot, Low-Profile GPU. I think you're confusing "low profile" with "single slot"
I decided to upgrade an i5-2400 SFF from HP with a low profile GTX 750. It was (more than a year ago) less than $80 USD and gave the computer enough power to handle even games such as Witcher 3 at 1080p, albeit only at 30 fps with low/medium quality settings. Every game I tried played just fine, offering a great path moving from an Intel HD2000 unable to handle any kind of modern game to even high-end titles.